I taught a scrumbling class this afternoon and each of the ladies did basically the same thing. I am always amazed at how cool they turn out and at how different they become due to yarns. Nancy made the scrumble above. She was a fast worker, so I had her crochet a corkscrew flower to go with hers. She was using yarn that I spun last weekend at the street fair. I did not plan that they would all go together, but they certainly do. The above scrumble by Audrei was made using the exact same directions, which were not really specific, since scrumbling is meant to be freeform. We decided that her original garter stitch piece looked a lot like the state of Texas. She used more of the 4th Ave yarn. 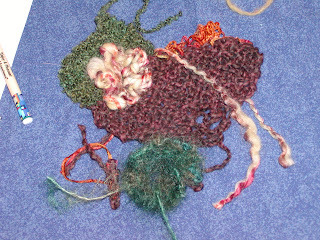 Marcia used commercial yarns to knit and crochet her piece. 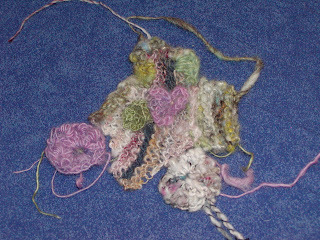 The cool looking flower is nothing more than chains and single crochets. The yarn does the rest. They were a good group. 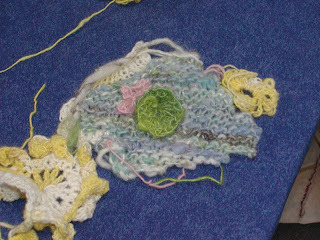 I am offering the class again as a freefrom knit and crochet class next Saturday from 1-4. I have decided to roll the instruction for both the scrumbling and the freeform into one session. Makes more sense and frees people up to go in either direction. See my website for details, or email me at jmarckathy@aol.com, if you are interested.